Abstract: The Central Dobrogea Shield is a part of the Moesia, a Paleozoic composite terrane located southward of the North Dobrogea Alpine orogen. The two geological units are separated from each other by a trans-lithospheric discontinuity, the Peceneaga-Camena transform fault. Along this fault, remnants of a Variscan orogen (i.e. North Dobrogea), recycled during the Alpine orogeny come in contact with two lithological entities of the Central Dobrogea Shield, unaffected by the Phanerozoic orogenic events: the Histria Formation, a flysch-like sequence of Ediacaran age very low-grade metamorphosed and its basement, the medium-grade metamorphosed Altîn Tepe sequence. Southward, along the reverse hidden Palazu fault, the Histria Formation meets South Dobrogea, formed of quite different geological formations. Detrital zircon from the Histria Formation yielded U/Pb LA ICP MS ages that show provenance patterns typical of peri-Amazonian terranes. Such terranes were sourced by orogens ranging from Paleoarchean to Neoproterozoic. The ages between 750 and 600 Ma differentiate the Amazonian sources from the Baltican and Laurentian sources, since they are lacking from the last ones. The youngest ages of 587 and 584 Ma suggest for the Histria Formation a maximum late Ediacaran deposition age. 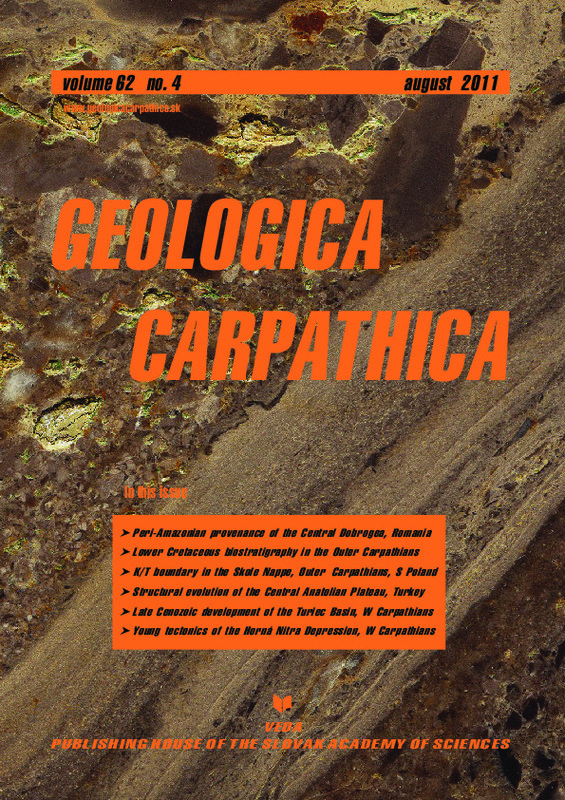 At the same time, the continuity of the Ordovician sediments over the Palazu fault revealed by drill-cores favours a Cambrian junction between Central and South Dobrogea. Abstract: Almost black shale filling fissures in the Stramberk Limestone belonging to the Silesian Unit, Outer Western Carpathians contain prolific and poorly to moderately well preserved spores, pollen, organic-walled dinoflagellate cysts, foraminifers, and calcareous nannofossils. A detailed micropaleontological analysis of the proved stratigraphical interval from the Valanginian to the Albian indicated sedimentary conditions of brackish, restricted marine, shallow-marine and neritic sedimentation. Moreover, it drew attention to occasional influence from the Boreal province in the depositional area of the NW part of Tethys, especially during the Early Valanginian and Hauterivian, as supported by the presence of high-latitude nannofossils and organic-walled dinoflagellate cysts. Terrestrial miospores form a significant component of palynoassemblages and give evidence of continent proximity in the Valanginian-Barremian interval. Samples were acquired from isolated fissure fills in the Stramberk Limestone and, therefore, they do not represent a continuous section. Abstract: The Cretaceous-Paleogene (K-T) boundary has been recognized in turbiditic sediments of the Ropianka Formation in the Skole Nappe (Bakowiec section) on the basis of planktonic foraminiferids with an accuracy of 40 cm. Such precise determination of the K-T boundary for the first time in the Carpathians and in turbiditic flysch sediments in general was possible due to the successive occurrence of the Early Paleocene planktonic taxa of the P1 Zone above the latest Maastrichtian Abathomphalus mayaroensis Zone with the Racemiguembelina fructicosa Subzone. The trends in composition of the latest Maastrichtian foraminiferal assemblages are similar to the Gaj section from the adjacent thrust sheet, probably due to the influence of the same paleoenvironmental factors. Abstract: The NW–SE striking extensional İnönü-Eskisehir Fault System is one of the most important active shear zones in Central Anatolia. This shear zone is comprised of semi-independent fault segments that constitute an integral array of crustal-scale faults that transverse the interior of the Anatolian plateau region. The WNW striking Eskisehir Fault Zone constitutes the western to central part of the system. Toward the southeast, this system splays into three fault zones. The NW striking Ilıca Fault Zone defines the northern branch of this splay. The middle and southern branches are the Yeniceoba and Cihanbeyli Fault Zones, which also constitute the western boundary of the tectonically active extensional Tuzgölü Basin. The Sultanhanı Fault Zone is the southeastern part of the system and also controls the southewestern margin of the Tuzgölü Basin. Structural observations and kinematic analysis of mesoscale faults in the Yeniceoba and Cihanbeyli Fault Zones clearly indicate a two-stage deformation history and kinematic changeover from contraction to extension. N-S compression was responsible for the development of the dextral Yeniceoba Fault Zone. Activity along this structure was superseded by normal faulting driven by NNE-SSW oriented tension that was accompanied by the reactivation of the Yeniceoba Fault Zone and the formation of the Cihanbeyli Fault Zone. The branching of the İnönü-Eskisehir Fault System into three fault zones (aligned with the apex of the Isparta Angle) and the formation of graben and halfgraben in the southeastern part of this system suggest ongoing asymmetric extension in the Anatolian Plateau. This extension is compatible with a clockwise rotation of the area, which may be associated with the eastern sector of the Isparta Angle, an oroclinal structure in the western central part of the plateau. As the initiation of extension in the central to southeastern part of the İnönü-Eskisehir Fault System has similarities with structures associated with the Isparta Angle, there may be a possible relationship between the active deformation and bending of the orocline and adjacent areas. Abstract: The development of the Turiec Basin and landscape evolution in its catchment has been reconstructed by methods of geological research (structural geology, sedimentology, paleoecology, and geochronological data) as well as by geophysics and geomorphology. The basin and its surrounding mountains were a subject of a mass balance study during periods of tectonic activity, accompanied by considerable altitudinal differentiation of relief and also during quiet periods, characterized by a development of planation surfaces in the mountains. The coarse clastic alluvial fans deposited beneath the offshore pelitic sediments document the rapid Middle Miocene uplift of mountains on the margin of the Turiec Basin. The Late Miocene fine-grained sedimentation represents the main fill of this basin and its origin was associated with the formation of planation surfaces in the surrounding mountains. The rapid uplift of the western and northern parts of the catchment area during the latest Miocene and Early Pliocene times further generated the deposition of coarse-grained alluvial fans. The Late Pliocene basin inversion, due to uplift of the whole Western Carpathians mountain chain, was associated with the formation of the Early Quaternary pediment and ultimately with the formation of the Turiec river terrace systems. Abstract: The Horna Nitra Depression is an Upper Miocene–Quaternary intramontane sedimentary basin. This N–S elongated half-graben structure is rimmed from the west by the marginal Mala Magura fault which is the most distinctive fault in the Horna Nitra Depression, traditionally considered as an active fault during the neotectonic phase. This dislocation is attended by contrasting landforms and their parameters. The low S-index of about 1.10, at least two generations of well-preserved faceted slopes along this fault, and longitudinal river valley profiles point to the presence of a low-destructed actual mountain front line, which is typical for the Quaternary active fault systems. Comparison with known normal fault slip rates in the world makes it possible to set an approximate vertical slip rate between 0.3–1.1 m•kyr–1. The present-day fault activity is considered to be normal, steeply dipping towards the east according to structural and geophysical data. The NNW–SSE present-day tectonic maximum horizontal compressional stress SH and perpendicular minimum horizontal compressional stress Sh was estimated in the Horna Nitra region. The Quaternary activity of the Mala Magura fault is characterized by irregular movement. Two stages of important tectonic activity along the fault were distinguished. The first stage was dated to the Early Pleistocene. The second stage of tectonic activity can by dated to the Late Pleistocene and Holocene. The Mala Magura fault is permeable for gases because the soil atmosphere above the ca. 150 meters wide fault zone contains increased contents of methane and radon.